Turkey tags will be in the mail by the third week of February. Turkey tags are free. In order for you to receive the tags you will need to set up an account with SCDNR. This will protect you and SCDNR from privacy issues. Note: You may already be designated to receive turkey tags by mail. You can determine so by looking at your hunting license. 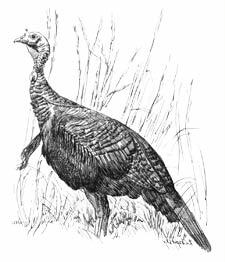 If "Seasonal Wild Turkey Tags" appears on you license then you will get the tags by mail in mid-February and there is no need to order tags on line. If this does not appear on your license then proceed with ordering your tags online.